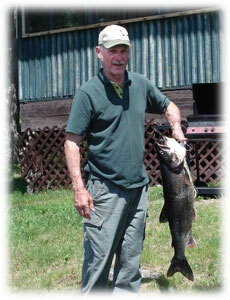 Fishing is one of the main activities we offer. The season begins in May and ends in the fall. Lake Kipawa is a superb lake; it overflows with Lake Trout, Walleye and North Pike. 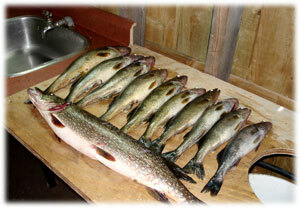 On occasion it is possible to catch Lake Whitefish as well as Perch, but these two species are in smaller quantity. 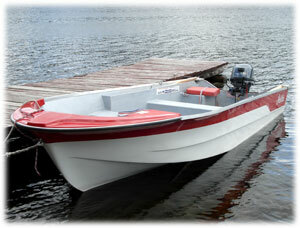 The boats which are at the disposal of the fishermen (and women) are 16 feet in length and are equipped with a newer 4 stroke, 15 horsepower motor. All boats are equipped with necessary safety equipment. Location of the specie: In the beginning and the end of the fishing season, this type of fish is caught near the surface. During summer however, it is caught much deeper where the water is colder. Location of the specie : Fleeing light and warm water, this type of fish can be caught near the surface early in the morning or late in the evening and is found deep in the water during the day. This fish is less active during the day. Location of the specie: Being a great predator, the northern pike swims in shallow water and generally uses the underwater vegetation or anything that can camouflage it to hide. Located on the premises, our fish hut can be used to clean and package your fish. Each cabin is equipped with a fridge and freezer, so keeping your catch to take home is made simple!